If you want to experience Kolkata Durga Puja, ideally you should be in the city at least a week before the festival starts so you can see the finishing touches being put on the idols of the goddess. If that's not possible, there are still plenty of other ways to enjoy it -- all night long! Here's the best of them. The easiest way to participate in the celebrations is to take a Durga Puja festival tour, such as the ones organized by the West Bengal Tourism Development Corporation (see list of tours and make online bookings here), Calcutta Photo Tours, Calcutta Walks, Walks of Kolkata, Jupiter Travels and Let's Meet Up Tours. More information abut Durga Puja, including tours, is also available on West Bengal Tourism's Durga Puja website. Alternatively, for something different, take one of the special puja tours by tram offered the Calcutta Tramways Company. The beautifully handcrafted idols of Goddess Durga sure are stunning. However, you'll appreciate them even more if you see the effort that goes into making them. Fortunately, this isn't hard to do. The majority of them are crafted in one area -- Kumartuli in north Kolkata, around 30 minutes drive from the city center. The name literally means "potter's locality" and as it suggests, the area was settled by a group of potters. Nowadays around 150 potter families live there. If you go there on the occasion of Mahalaya (around a week before Durga Puja starts) you'll be able to see the eyes being drawn onto the statues in an auspicious ritual called Chokkhu Daan. Durga Puja commences with the invocation of the holy presence of Goddess Durga into the idols. The ritual begins early in the morning, before dawn, with the bathing of a banana tree in the Hooghly River. The banana tree is dressed like a newlywed bride (known as "Kola Bou", the banana bride) in a sari, and used to transport the goddess's energy. The best places to attend the ritual are Prinsep, Bagh Bazaar and Ahiritola ghats. The highlight of Durga Puja is no doubt visiting the many different displays (pandals) of Goddess Durga, each with a unique theme or decorative style. This activity is commonly referred to a "pandal hopping". There are thousands of pandals in Kolkata so it's only possible to visit a fraction of them -- and even then it requires a bit of strategic planning as they're spread out all over the city. You'll find the most well known ones in north and south Kolkata, which is conveniently connected by the Metro railway. The most popular time for pandal hopping is in the night when they're lit up. If you go during the day, you can avoid much of the crowd. While Kolkata's public Durga pujas tend to get all the attention, the traditional "Bonedi Bari" pujas in the city's palatial old private mansions are also really worth experiencing. The mansions belong to affluent aristocratic zamindar (landowner) families who have been carrying on the pujas for centuries. They're spread out across Kolkata (as well as other major towns in Bengal). Two of the most famous ones are Sovabazar Raj Bari and Rani Rashmoni Bari in north Kolkata. Lets Meet Up Tours runs full-day Bonedi Bari Tours to these and more. West Bengal Tourism also conducts bus tours. About an hour and a half south of Kolkata, the superbly restored Raj Bari is holding a grand royal Bonedi Puja. Advance reservations are required to attend. Alternatively, South Bengal State Transport Corporation operates bus tours to the Raj Bari puja and others south of Kolkata. The Kumari Puja is another significant ritual that's performed during the Durga Puja festival. During the festival, Goddess Durga is worshiped in various forms. In this ritual, she's worshiped the form of an innocent young unmarried virgin girl. This serves as reminder that the goddess and her energy are omnipresent in all beings. 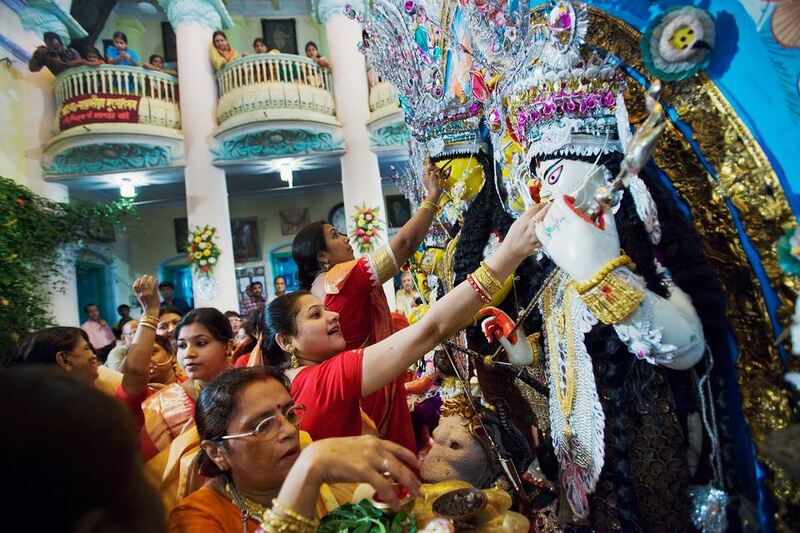 Belur Math in Kolkata holds an extensive program of rituals for Durga Puja, including a special Kumari Puja. After the evening rituals on Ashami, it's traditional for the devotional Dhunuchi folk dance to be performed in front of Goddess Durga to please her. This is done holding an earthen pot filled with burning coconut husk and camphor. Drummers lead the dancers with their beats, which vary in speed. Smoke, sound and rhythmic swaying engulf the atmosphere. It's intense and intoxicating! The dance is inclusive and anyone, men and women, can join in. It has become so popular that people have started organizing competitions. There's never a better time to sample Kolkata's famous Bengali cuisine than Durga Puja. The festival isn't considered to be complete without food! You'll find a wide array of it everywhere -- on the streets, at the pandals, and in specialty Bengali restaurants. Pandal hopping does get tiring, so eating while you're out and about is a must. The food served to visitors at the pandals is called bhog (offerings to the god which are distributed). It commonly consists of mixed vegetable curry, a sweet dish, fried item, and chutney. Kolkata's Bengali restaurants have exclusive Durga Puja menus packed full of authentic delicacies -- both buffet and a la carte. Bengali sweets are also consumed in huge quantities during the festival! On the last day of Durga Puja, known as Dashami, the festivities commence with married women placing red sindoor (powder) on the idols of Goddess Durga. They then smear it on each other. In the evening, the idols are immersed in the water. One of the most popular immersion points is Babu Ghat (centrally located near Eden Garden), although you'll be able to catch the action at any of the ghats along the river. An excellent way of seeing it is by boat. West Bengal Tourism Development Corporation conducts special immersion boat cruises down the river. Otherwise, head to Red Road to watch the Durga idols being taken in procession to the ghats as revelers chant, “Aasche bochor abar hobe!” (It’ll happen again next year! ).